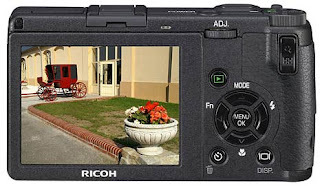 Ricoh is coming out with the successor to its high-resolution GR DIGITAL released in October 2005. The GR Digital II features 28mm equiv. lens from its predecessor, matching it to a new 10-megapixel sensor and new GR Engine II image processing system. There is a new electronic leveling system (like the Nikon D3) and the option to shoot TLR-style square images. It comes with a larger buffer memory and halved RAW file-write time with the option of continuous shooting. Battery life is improved with up to 370 shots now possible on a charge, an up from the previous 250 shots. It boasts of a compact 25mm thin magnesium alloy body. A new 1/1.75-inch CCD with 10.01 million effective pixels is employed to achieve improved resolution with an increased number of pixels. The camera features a warning sound sensor that can be set to let you know if the camera is level during shooting. The camera has a 2.7-inch, 230,000-pixel display with a high 160º viewing angle is easy to view from both low and high angles. A variety of monochromatic expressions are possible with the black-and-white settings. Color, color depth, contrast, and sharpness of an image can each be adjusted in +/- five steps. Color can be selected as desired from sepia, red, green, blue, and purple. The function button allows for one-push mode switching. Settings can be registered to switch between "JPEG and RAW," "Snap and AF," "color and black & white," and others for quick switching of modes when sudden photo opportunities present themselves. 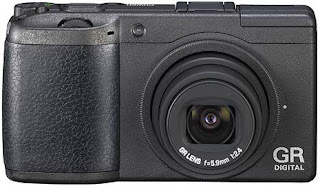 The Ricoh GR Digital II will cost £399.99 ($834) when it hits UK shops in December.